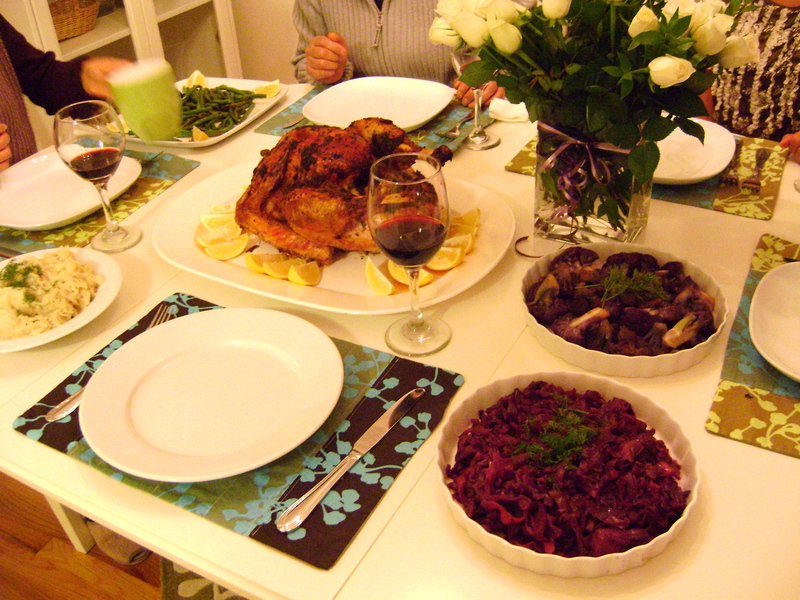 I still remember my first Thanksgiving dinner vividly. It was 1985, a year after we came to the states, and we were invited to my parents’ friend’s house, who cooked us and other new Japanese expats traditional Thanksgiving dinner of turkey, stuffing, yams, cranberry sauce – the works (they were also Japanese but had been in the U.S. much longer than many of us there). Perhaps looking back, maybe those dishes were not all that authentic (I have a sneaking suspicion that there were soy sauce hidden somewhere) but for many of us who were completely foreign to this mysterious holiday, seeing a whole turkey displayed beautifully across the table never felt more American — the world we only knew through movies and books! For the next two decades, our family developed our own Thanksgiving tradition, with my mother cooking turkeys and traditional side dishes. It was a trial and error for my mother, who learned to cook turkey and stuffing simply by looking at holiday spreads on a magazine, and peaking her curiosity while strolling down the isles at a supermarket in the autumn months. About five years ago, my mother passed down the torch and Thanksgiving became my holiday, and a chance to hone my cooking skills. I was becoming increasingly interested in cooking and baking around that time, and she thought it was a good chance for me to tinkle around in the kitchen, while she finally got to relax. For the first several years, I cooked the same items my mother cooked, the same way she cooked them. But through time, I got bored with traditional stuffing and mashed potatoes, and decided to explore into more seasonal and healthy alternatives. I replaced regular turkey with an organic, free-range kind. I ditched regular potatoes for parsnips. I bid farewell to heavy cream and welcomed in soy milk. And I even said goodbye to pancetta, bacon, and another flavor-enhancing animal products and replaced them with vegetable or chicken stock. I even started using agave nectar in place of sugar. Sure, I agree that these products make foods taste delicious and I may incorporate them from time to time, but everything is done in moderation. And when I do use BS ingredients (Butter and Sugar), we only eat a very small portion of it. Our Thanksgiving has evolved into a unique culinary festivity with no real resemblance of the old tradition, but I think our family enjoys the new tradition that we’re rewriting every year. 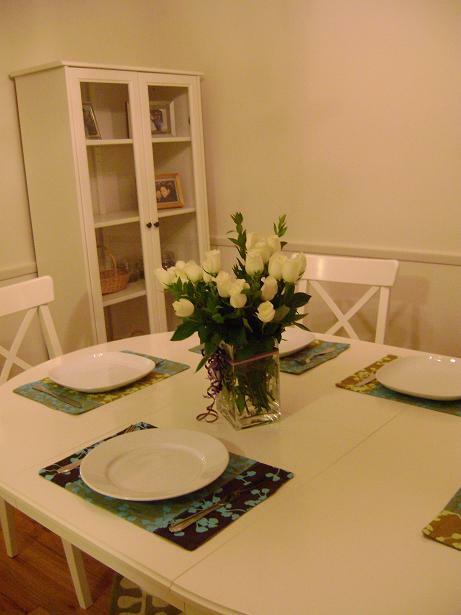 This was my first year hosting the dinner at my new place, and while every part of my body was hoping to impress everyone with beautiful centerpiece and mind-blowing dinner, I decided to go the opposite direction and go super simple, serving dishes that required only little cooking. 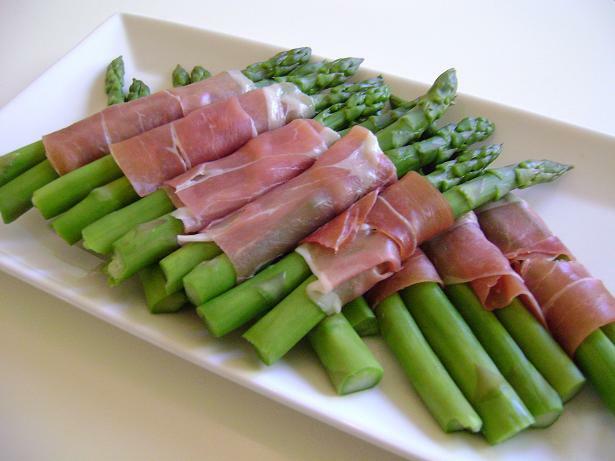 For starter, I prepared my go-to appetizer of prosciutto-wrapped asparagus for everyone to enjoy when they arrived. Everyone munched on these, olives and enjoyed red wine while I finished up the last of cooking. 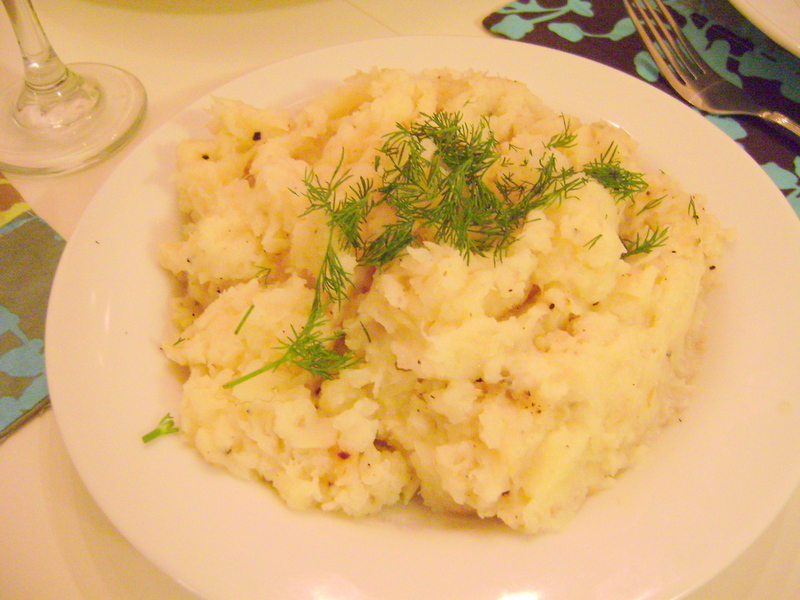 Instead of the traditional mashed potatoes, our family favorite is mashed parsnips made by mashing the boiled roots and cooking it with low-fat milk (it is so sweet, filling, and delicious). 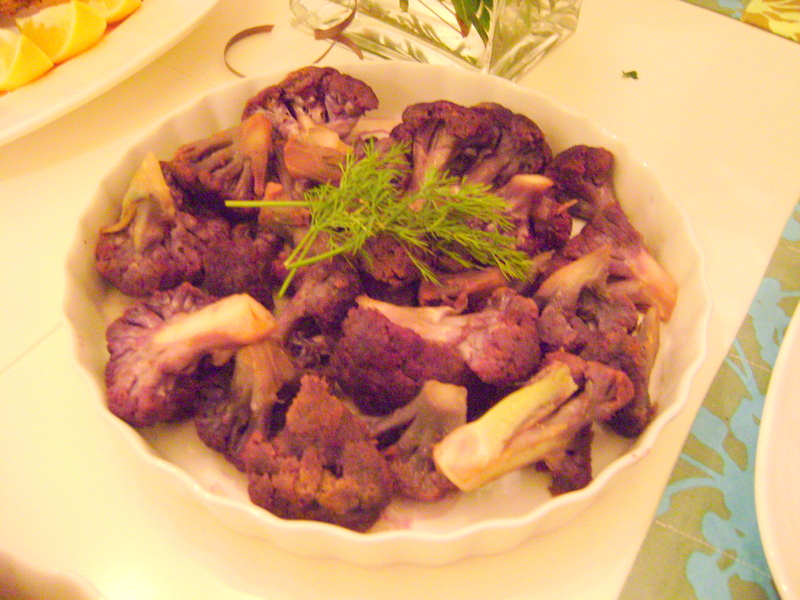 I did not plan on cooking a cauliflower dish until I found these purple ones at a supermarket. It was so beautiful and enticing that I HAD to have it. I cooked the florets with chicken stock and flavored them with curry powder and cinnamon. 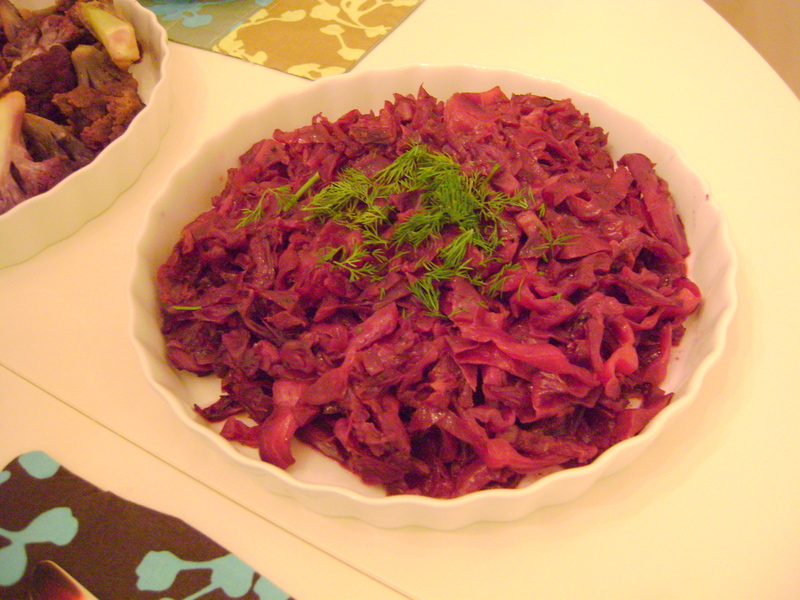 This red cabbage dish was perhaps my favorite of the night. I picked up the red cabbage because I fell in love with the deep purple color (what is up with me and the color purple this year? ), and while trying to figure out what I should do with it, I came across this recipe for Braised Red Cabbage on the Food Network site, courtesy of Guy Fierri. I didn’t follow the recipe much, but I got the inspiration to cook it in red wine vinegar and agave nectar for a perfect combination of sweet and tangy! I know I’m going to make this dish over and over again! Our Thanksgiving is not complete without the simple but delicious grilled vegetables. 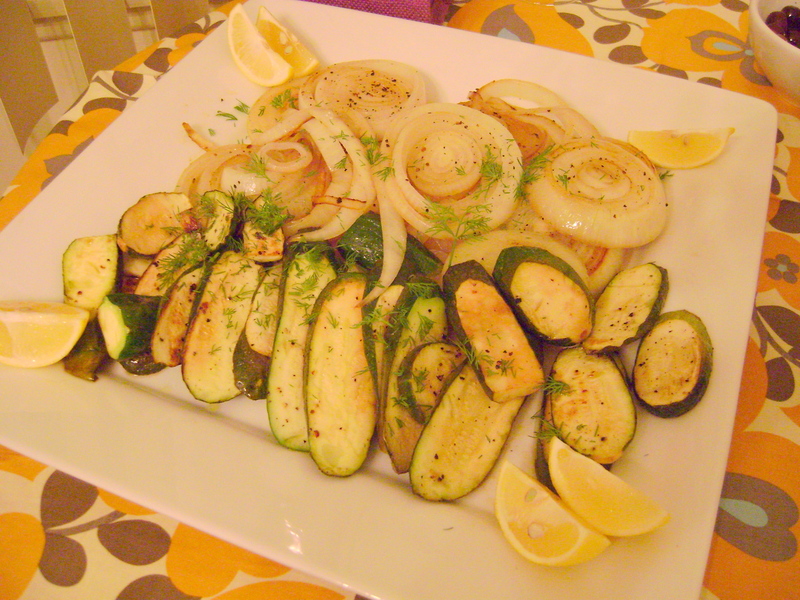 I marinated the sliced onions and zucchinis in olive oil and red wine vinegar for several hours, and grilled them on a pan with a little more olive oil. 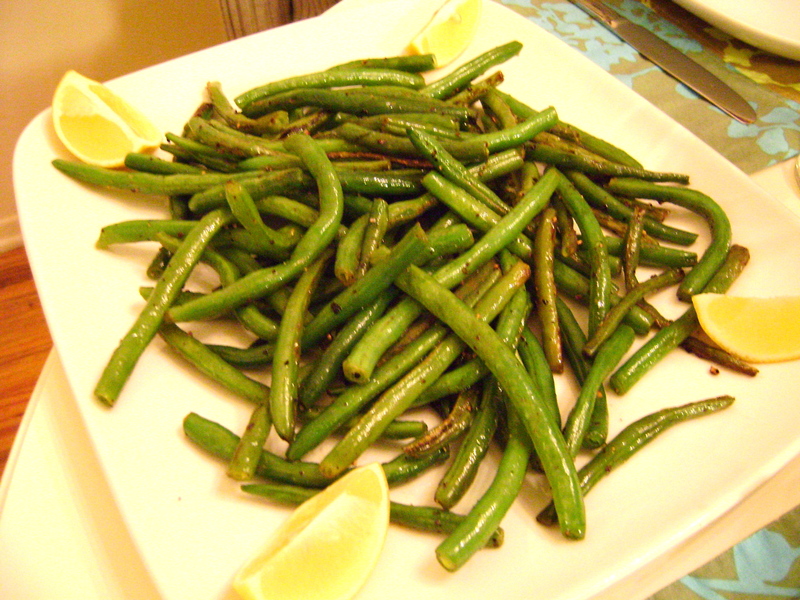 This sautéd string beans was inspired by a dish I had the other day at Buca di Beppo. I fell in love with the way the string beans were flavored with tangy lemon, and I tried to replicate it here. I don’t know why people buy a canned cranberry sauce when it’s so easy to make one yourself that tastes 10 times better than the manufactured ones! 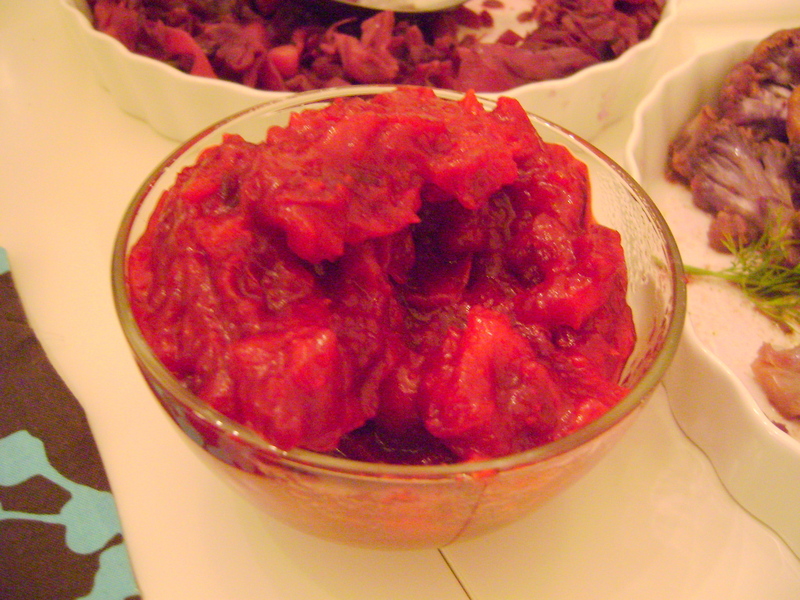 I made mine by cooking the cranberries with a juice of one orange, its rind, three tablespoons of agave nectar and a teaspoon of vanilla extract. 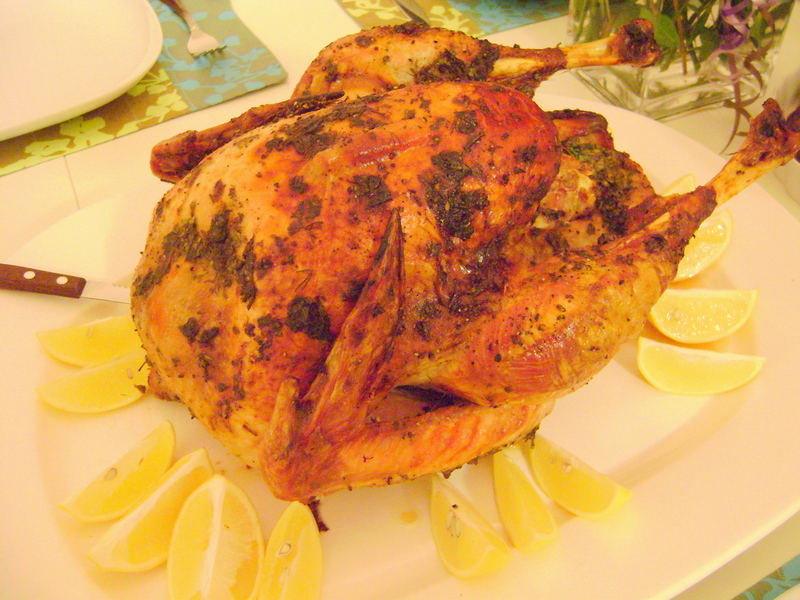 It was still very sour but it tasted so good with turkey meat! 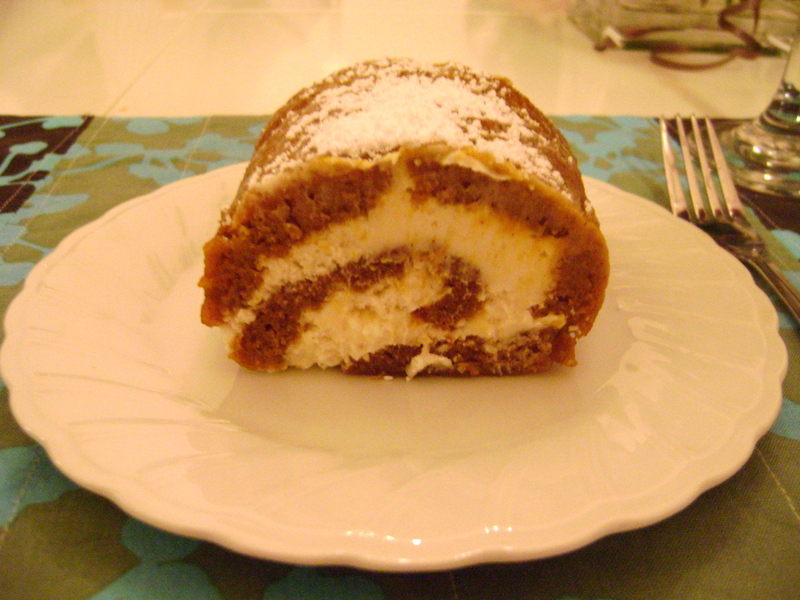 And last but not least, I made Ina Garten’s Pumpkin Roulade with Ginger Buttercream for dessert (okay, you caught me. This is THE super duper guilty portion of the meal ). I was intimidated at first because the recipe was labeled “difficult,” but don’t believe it – this is really simple to make! It is a little tricky to roll the cake with a kitchen towel but if you follow the direction carefully, it will come out okay. The pumpkin spice cake was delicious and the mascarpone filling was so rich that you only need a small slice to feel satisfied and completely euphoric (which is great when you only have a little room left in your stomach)! OMG! How you find time writing on your blog?… You are amazing..
Congratulations on the 10,000 hits on your green tea cookies…..